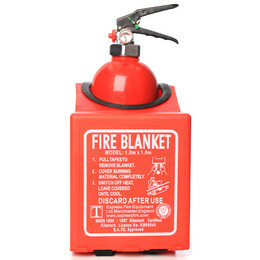 Unique storage for smaller fire extinguishers that can be easily flush or corner mounted to walls or cupboards and can also hold additional safety equipment including a fire blanket and smoke detector/carbon monoxide alarm. Provides quick and easy access to fire safety equipment. Can be easily flush or corner mounted to walls or cupboards. 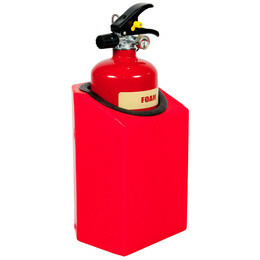 Can accommodate one number fire extinguisher: 2kg/litre foam, powder, wet chemical or 2kg CO2 fire extinguisher. Side panel includes the word ‘FIRE’. A fire blanket or emergency life hammer can be placed on the front of the Firecaddy and a smoke detector/carbon monoxide alarm can be fitted underneath. Ideal for use in a wide range of environments including kitchens, apartments, halls of residence, universities etc. Manufactured form strong and durable moulded plastic (will not chip or crack). Quick and easy to wall mount with standard wall bracket fixings such as those used for wall mounting pictures etc. (please note that fixings are not included).